Monk wick Junior School situated in Colchester, Essex plans to expand. The school project was obtained by Inkpen Downie after winning a mini competition to provide an extension of an existing 2.25FE school to a 3FE school. Designed using our Building Information Modelling services, the new teaching accommodation will be a two-storey building that matches the height and materials of the existing building. It will provide two new classrooms, a studio, a food technology room and a special educational needs room and a food science room within the extended building, within a newly landscaped setting. 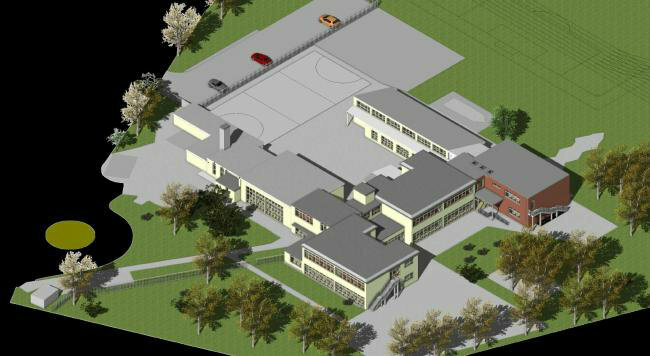 The design provides new stairs and a lift within a new double height hall which will serve the new classrooms and also help to improve circulation within the existing school. Additional car parking is planned and the existing play area will also be extended. Our education expertise has enabled us to deliver unique and modern designs for schools, colleges and nurseries. This scheme will create an extra 60 places in a bid to meet the growing demand from primary school places in Colchester.